Ricardo Moreno, research associate at the Smithsonian Tropical Research Institute (STRI) in Panama and director of the Yaguará Panamá Foundation, reported at the 20th Congress of the Mesoamerican Society for Biology and Conservation held recently in Belize that the number of jaguar killings in Panama is on the rise. "We have evidence that cattle ranchers killed a minimum of 230 jaguars in Panama between 1989 and 2014," Moreno said. "We have reason to think that the actual number may be two- or three- times higher. In 2015, 23 jaguars were killed. In 2016, through September, 26 jaguars were killed." Moreno and colleagues gathered reports of killings from a wide range of people, from tour guides to livestock owners. Most were in retaliation for predation on cattle, sheep and dogs. At the meeting, researchers evaluated the conservation status of animals from Mexico through Panama and the health of forests in the Mesoamerican Biological Corridor stretching along the Atlantic coast of Central America. Moreno shared results gathered during camera-trap surveys conducted 2005-2014 by a team led by Ninon Meyer, then a doctoral student with Patrick Jansen, STRI staff scientist and professor at the University of Wageningen, in 15 national parks and forest fragments on both sides of the Panama Canal to assess to what degree the remaining forest still supports wildlife diversity. "We know from recent work by geologists and paleontologists at the Smithsonian that the Panama land bridge connecting North and South America formed 2.8 million years ago," Moreno said. "The connection was broken 100 years ago by the building of the Panama Canal. 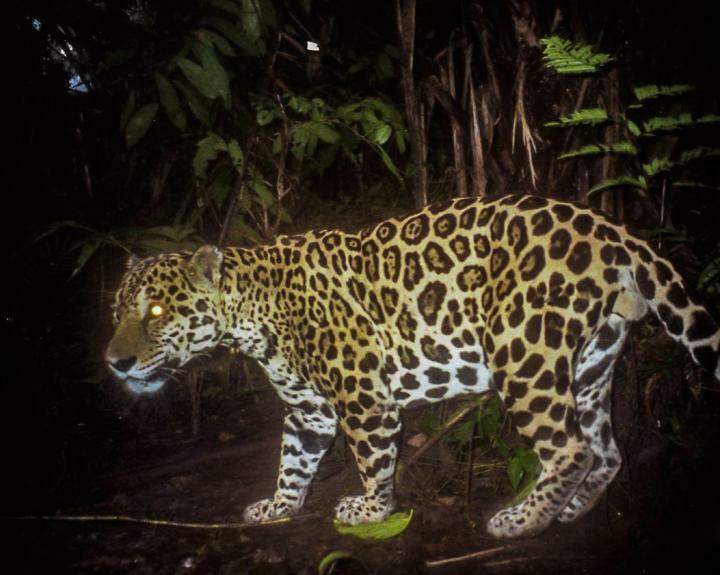 Continued development and deforestation of Central Panama is disrupting the flow of animals and their genes, so that now the jaguar is considered an endangered species." Moreno speculates that continued expansion of agriculture and urban areas, and new development projects such as mines and dams, now limit jaguar populations to steep, mountainous areas. An increase in human consumption of the jaguars' main prey species also exacerbates jaguar predation of domestic animals. Participants in a seminar focused on the current status of the white-lipped peccary (Tayassu pecari) reported declines in peccary populations across the region and a lack of the forest connectivity they require to breed as healthy populations. White-lipped peccaries, unique to the American tropics, live in formidable bands of 10 to 300 individuals and play an important role as architects of forest communities, structuring the forest by dispersing tree seeds and trampling plants. Indigenous groups have always hunted peccaries, but with the continued advance of agricultural frontiers, cattle ranches, new roads and large-scale development projects throughout the region, this species is now threatened with extinction. Peccaries are one of the primary species in jaguar diets, and when hunters pursue peccaries they often also kill jaguars. Education, especially in areas where the number of jaguar killings is high. Extension programs for cattle owners who have experienced jaguar predations. Economic incentives for rural communities near jaguar habitat. In one community, residents overcame losses due to predation by selling plaster casts of jaguar tracks. The creation of multi-institutional alliances to unite governmental and non-governmental institutions to intervene in key areas. "Education is key because we all deserve to understand what is happening on our planet and in our countries," Moreno said. "But education takes years and jaguars and peccaries don't have years." "We hope that our excellent scientific reporting on the status of these animals in the region is considered relevant," Moreno said. "We've written the action plans. We have the knowledge necessary to redirect policy in order to conserve jaguars, peccaries and forests throughout the region. In Panama, the Fundación Yaguará Panamá has the full support of the Ministry of the Environment. Jaguar conservation will take dedication on the part of governments, NGO's and passionate individuals united to conserve our natural heritage, which has no borders." The Smithsonian Tropical Research Institute, headquartered in Panama City, Panama, is a part of the Smithsonian Institution. The Institute furthers the understanding of tropical nature and its importance to human welfare, trains students to conduct research in the tropics and promotes conservation by increasing public awareness of the beauty and importance of tropical ecosystems. STRI website. Promotional video. R. Moreno, N. Meyer, M. Olmos et al. 2015. Causes of jaguar killing in Panama–a long term survey using interviews. Cat news. No. 62. Spring, 2015. pp.40-42.